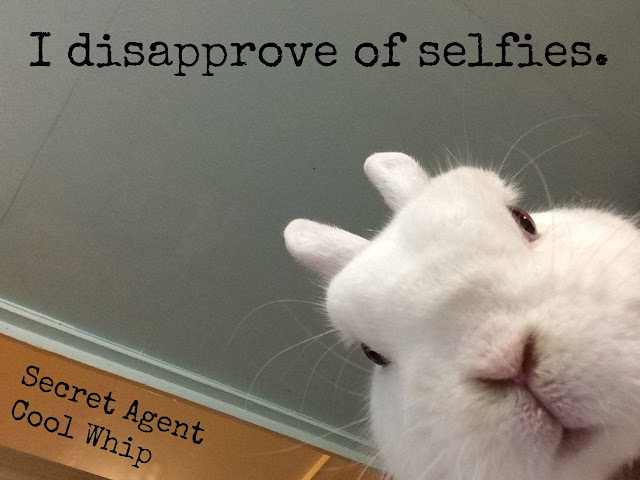 Secret Agent Cool Whip disapproves deep undercover at SaveABunny where he's been known to fight crime and solve mysteries for his fellow bunny residents. His full dossier here: http://saveabunny.org/rabbit/secret-agent-cool-whip. Awwww .. such a fine Secret Agent! Our little Benson had the ear tattoo too - very proud of it! Keep ferreting out unused disapproval and get it back on track there feller. Please don't look at me that way...I didn't do it...it was someone else...probably. A crime fighting bunny, awesome . Seriously, there would be no need for trials if bunnies did the interrogating; no need for the good bun cop/bad bun cop routine. Everyone would simpy confess under the intense heat of disapproval...even if they were innocent!